Boys Bedroom Update & Wall Decals Giveaway! Disclosure: This post is sponsored by Lulukuku. All opinions are my own. My boys are crazy about birds, especially Aiden. He can literally tell you all kinds of random trivia about them, so I thought this Bird Tree Wall Decal set would be perfect for their room. Lulukuku has a great selection of wall decals to choose from, especially for a nursery or kids’ room. They are cut custom-to-order, so you can select the colors for each part of the decal that you purchase. This allows you to choose a color combo that coordinates with your decor, as I did with this one. I chose white trees and leaves along with “spring green” and “rich navy” birds to match the boys’ navy and green color scheme. I also received some white birds and decals with their names on them, but I haven’t decided yet where I will put those. Maybe on the wall behind their bed? Not sure yet. I also plan on getting (or building) small desks for the boys at some point, so picture those between the trees along that wall. I’ll get to that eventually! We love the decals — they are so cute and added the perfect finishing touch to the bedroom. Aiden and Jake love them too! Now for the fun part! 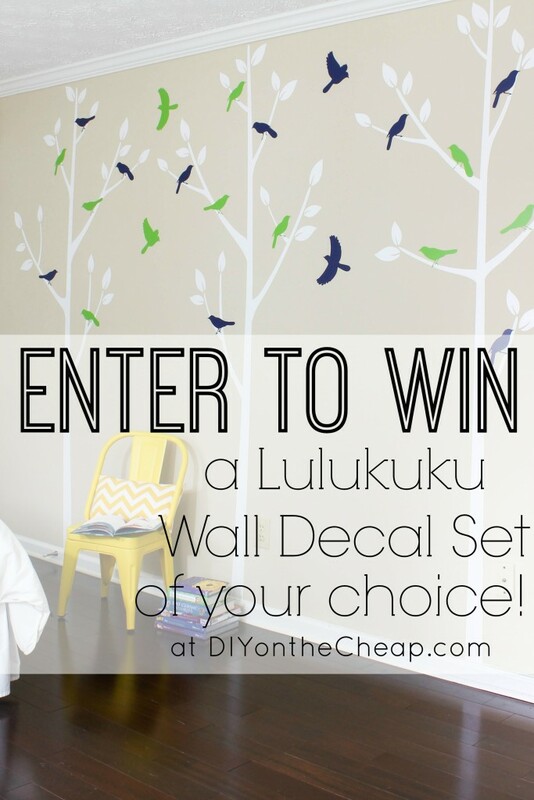 One of my readers will win a set of Lulukuku wall decals of their choice. To enter, simply wait for the Rafflecopter widget to load below and follow the instructions. 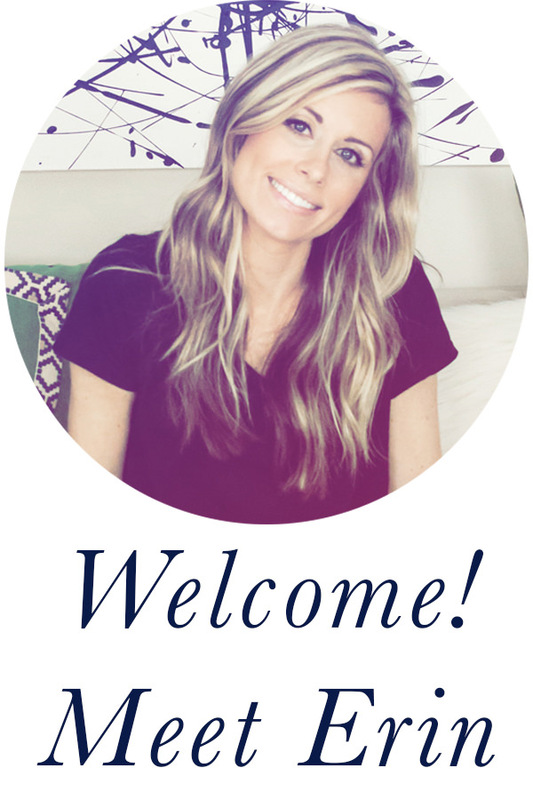 Email subscribers may need to click over to the blog in order to enter. Giveaway ends on Monday, January 19 at Midnight EST. Good luck! The room looks awesome, amazing what a beautiful wall treatment does!! I am loving the Large world map decals. I love the bird branch border. Cute, cute , cute!! Oh, how I love the world map decals. My husband and I love to travel and I have a small world map that I framed. One of those decals would keep us dreaming of our next trip. Thanks for the chance to win. Erin, the trees are so special, and I love how they go from baseboard to ceiling. The white is fresh and keeps the room from being too heavy looking for smaller boys. The Birds! Great touch, and it must have been such fun to place them! Did the boys help tell you where they should all go? Looks like a wonderfully fun product! I’m going to check them out, now. It looks great! I love the trees. Oooo I love these, I can imagine them in all sorts of rooms, not just a boys bedroom. What a simple and cute idea. These trees and birds are so sweet! They add such a fun touch to the room. what a beautiful and easy makeover!!! great job and love those colors! I like the world map. 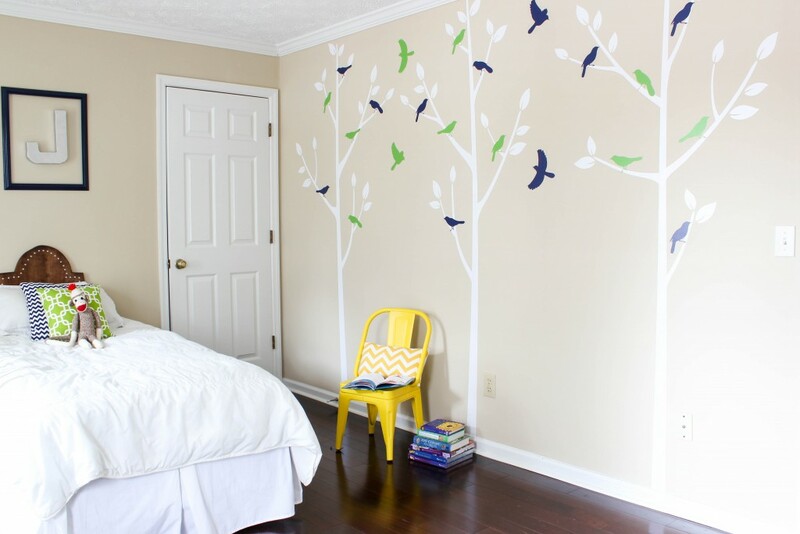 I like that tree decal with owl for a girls room. Adorable! 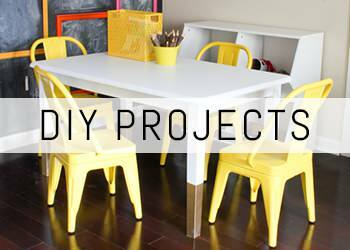 These really dress up a room without all the hassle of paint. 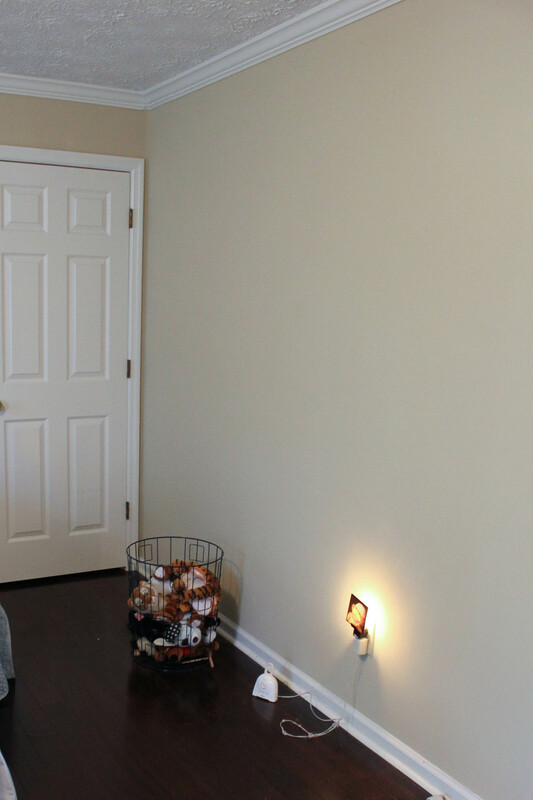 That yellow chair adds a nice pop of color against the grey wall. Such great ideas. I particularly love that this set up isn’t limited to a boy’s room. It’s very neutral and subtle. Not like footballs and ballerinas. the border decals are my favorite. I absolutely love the “Birch Forest” decals! I like them all, but I really love the Birch Forest Winter Tree !! I love the color combo,you used for your boy’s room,and I really like the “Border Decals”lulukuku offer! I love the Owl Mommy and Baby nursery tree. Too cute! Love how your boys bedroom turned out! I NEED one of the world map decals for our world traveler guest bedroom! I love the world map decals. Love the new decals! I love the chevron or patterned border vinyl decals! I think I’ll have to add this to my wish list for our next house! I really love the Birch Tree Wall Decals Sticker Set – Woodland Forest Decals – Aspen Tree Decals! 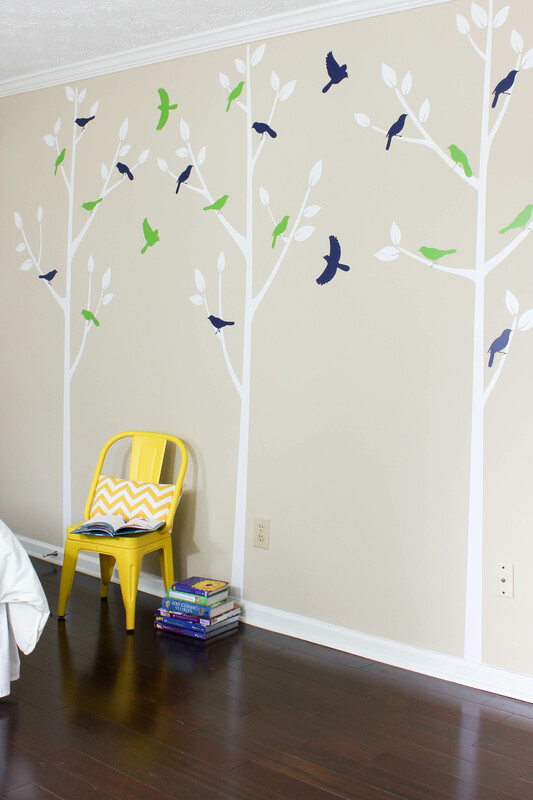 I would love to put up the Birch Forest Decals in my hallway!! Wow there are so many lovely ones, it’s hard to choose!… the world map decal is really cool for my son, and the tree branch with shelves for my daughter. My favorite is the Chinoiserie Rose Tree – Flower Girl Nursery – Removable Sticker Wall Mural – Rose Tree from Apartment Therapy. Thank you for the wonderful giveaway. 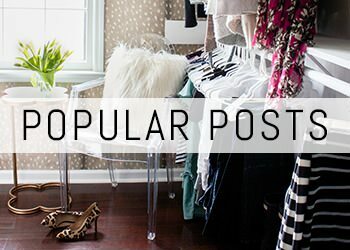 My favorite is the Nursery Wall Decal – Train Wall Art. Love the Chevron and Quatrefoil Nursery Wall Decal ! the tree decals are beautiful. the maps are so cute! I think the Birch Tree Wall Decals Sticker Set – Woodland Forest Decals – Aspen Tree Decal would look really cool in my sons room! I love the Rainbow Train decal! I love the Birch Tree Wall Decals Sticker Set – Woodland Forest Decals – Aspen Tree Decal! so cute! I love the Trellis design. It would look amazing in my half bath! I want one of the world maps! I love the Large World Map Wall Decal with Dots and Stars to mark countries decal the most. the birch forest decals are my favorite. I like the owl tree decals. This is perfect! I’ve been looking for a cute tree decal for our baby boy’s nursery. Thanks for sharing! the border decals are super cute. Love the butterfly decal. I’d use it in my classroom. I like the World Map decals.